Feminism has transformed the academic study of literature, fundamentally altering the canon of what is taught and setting new agendas for literary analysis. In this authoritative history of feminist literary criticism, leading scholars chart the development of the practice from the Middle Ages to the present. The first section of the book explores protofeminist thought from the Middle Ages onwards, and analyses the work of pioneers such as Wollstonecraft and Woolf. The second section examines the rise of second-wave feminism and maps its interventions across the twentieth century. A final section examines the impact of postmodernism on feminist thought and practice. This book offers a comprehensive guide to the history and development of feminist literary criticism and a lively reassessment of the main issues and authors in the field. 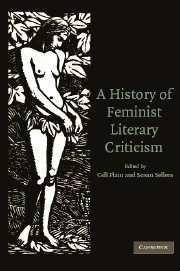 It is essential reading for all students and scholars of feminist writing and literary criticism.